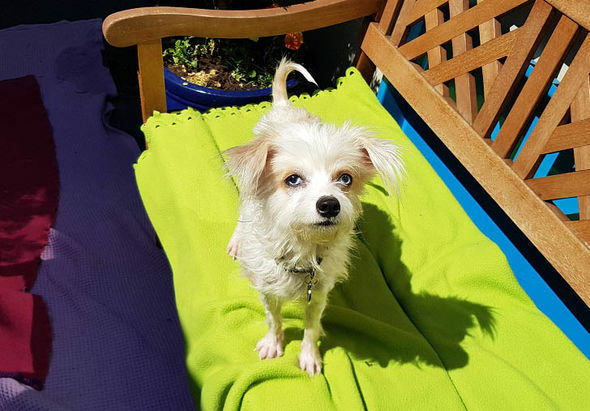 A TERRIFIED blue-eyed dog was left wandering sunbaked streets in a T-shirt with temperatures hitting 30C. When rescuers peeled off the dog’s bright pink top, they found she was sweltering hot and with her skin almost the same colour as her designer wear. These heart-wrenching pictures show how the three year old stray needed urgent care when she was brought into London’s famous Mayhew animal centre. Record temperatures and blazing sunshine are highlighting the serious dangers pets face in heatwaves, whether they are left to cook inside locked vehicles or suffer heatstroke by being walked in the hottest part of the day. The plight of Fizz the abandoned blue-eyed mix breed has been revealed by the 130-year-old charity to raise awareness of the dangers of letting dogs roam in the heat. 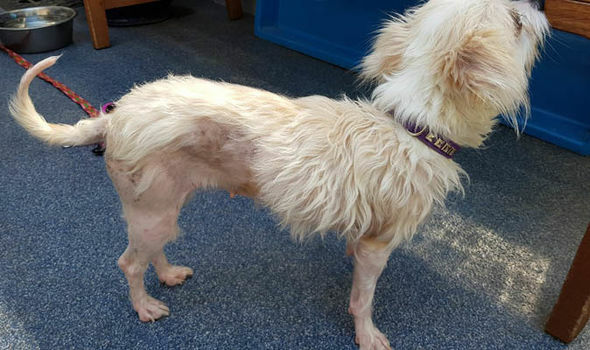 “There are many risks and dangers for an animal roaming the streets on their own, whatever the weather, but it was almost 30 degrees that day, and when I took off Fizz’s T-shirt I could feel the heat coming off her body,” said Mayhew’s head of kennels Janet Nobbs today. “She was thin and losing the fur on her rib cage, all the way down her back legs and her tail. There were scabs on her chest and tummy where the skin had become really sore and her front legs were pretty much bald. Fizz was discovered wandering in Roundwood Park, Brent, north west London, during a heatwave earlier this summer. She had no collar and was not microchipped, leaving the charity to fear she was deliberately abandoned. 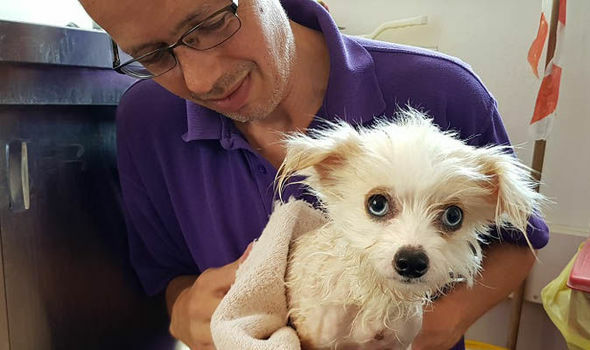 Under Mayhew’s veterinary team, Fizz was given medicated baths and cream to sooth her sore skin as well as treatment to deal with ticks and fleas. After a week with us, Fizz began to look a lot better,” added Ms Nobbs. Now fully vaccinated and spayed, Fizz has already been selected for adoption and has a new home.